Dirt — it has one goal. It wants to get in your home and make all your sweeping, mopping, and vacuuming seem completely useless. As much as you try, the dust and muck from outside wants to get inside, usually right before company drops by. The dog paws, the gardening dirt, the kid or grandkid footprints, whatever the cat drags in, it all seems to end up right in your line of sight as the morning sun hits your floor, and you throw up your hands and agonize over where it all comes from! A time-tested habit for keeping your home cleaner is to remove outer footwear before coming into the home. But this creates the problem of where to put all the sandals and running gear, gardening boots and soccer shoes, sandy flip-flops and mud-encrusted hunting boots. The solution is the humble mudroom. While the name doesn’t sound very inviting, a well-designed mudroom becomes the hub of a well-run household. After you get a mudroom, you’ll wonder how you ever lived without one! A typical mudroom is in close proximity to the garage, laundry, or one of the outside entrances — typically a rear or side entrance. It’s a way station for your family’s “outside” life as members switch to the “inside” life. A mudroom is a great place to store sport equipment, a spot to hang school backpacks, and a designated area to house the pet grooming gear, gardening clogs, boots and running shoes. Basically, items that fall into the “grubby but necessary” category of life’s necessities should end up in a mudroom. Two important elements of a useful mudroom are storage and easily cleaned flooring. Storage might be as simple as a bench with cubbies underneath or as elaborate as a full wall of built-ins. Flooring is even more vital because it’s not called a mudroom for nothing! While tile is often used in mudrooms, it has a huge drawback. Tile has grout. Grout gets dirty. A much easier to clean and maintain surface for your soon-to-be favorite room of the house is a custom epoxy flooring option from California Custom Coatings. No grout, no seams, no worries — that’s what you want for your mudroom. 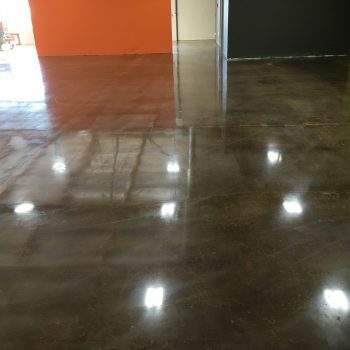 Choose an epoxy coating in an array of colors, or a stained and polished concrete surface treatment. Consider adding a non-slip finish, since mud is definitely slippery! Epoxy coatings provide a worry-free and durable surface for your mudroom, laundry area, screened-in porch, patio or garage. The kids can’t ruin it, the dog won’t scratch it, and years of use and abuse don’t bother the floors we install. Contact the experts at California Custom Coatings for advice on which epoxy floor coating is perfect for your Sacramento or Northern California home!